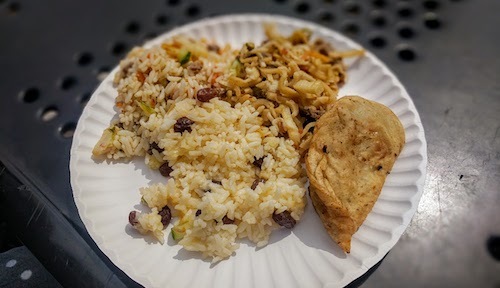 After failing to find food at last summer's Mongolian cultural party in Central Park, I was much more determined to eat at the Spring Mongolian Food & Networking Day, the brainchild of Byambakhuu Darinchuluun, who runs Made in Mongolia NYC and the Mongol Heritage Foundation. 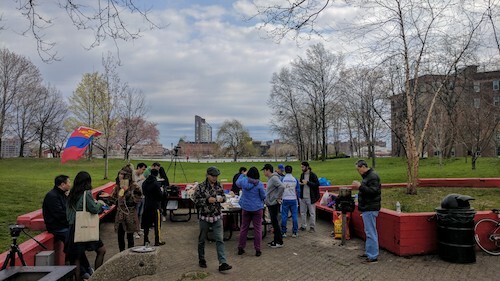 Luckily the event took place on Roosevelt Island on a Saturday with barely any subway service to begin with, but also had a track fire in Queens that halted the F line completely. After four transfers and a tram ride, and two hours and fifteen minutes after departing, it seemed that my commute actually was lucky compared to others. When Byambakhuu first showed up in my life, it was unfortunately for an event that I was unable to attend. Our dear friend Charles helped put on an amazing fundraiser that featured Mongolian food and culture back in 2012. When his smiling face greeted us as we apprehensively approached his group, all the previous high praise was instantly verified. 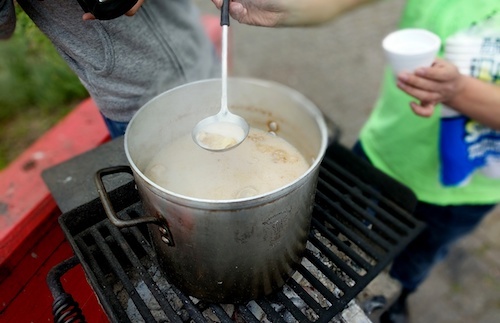 He immediately directed us the the cauldron of "tea" that was brewing on one of the park's public grills (above). 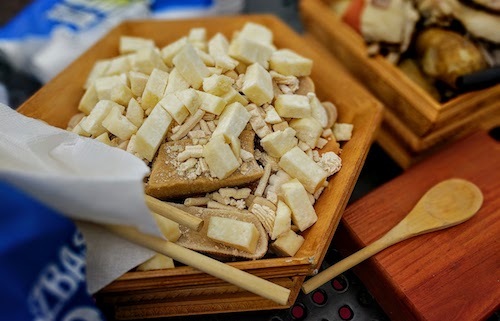 Unlike any other tea we had ever tried, there were meat dumplings and a fatty milky liquid. We were assured it was green tea, although I grabbed a fork just in case. A photogenic plate of homemade cheeses (below) was the second most noticeable dish on the spread this day. I asked about the process of cheesemaking, which seemed simple enough, but lost count of the steps. There was boiling milk with a certain kind of yogurt, fermenting, separating, making shapes and design, and drying, amongst others. The plate that stood out most was the goat meat (below), which was topped with the smiling head of the unfortunate animal that became the meal. Sliding this to the side, one could find ribs and other parts to take and eat, all of which were rather fatty but very good. We started noticing that people were adding pieces of it to their tea as well. Along the buffet line were also homemade rice and noodle dishes (below). The noodles in the middle took best in show, while the sweet rice with raisins was also enjoyed. When combined on a plate with a lamb dumpling (below), a well-rounded meal started to take shape. 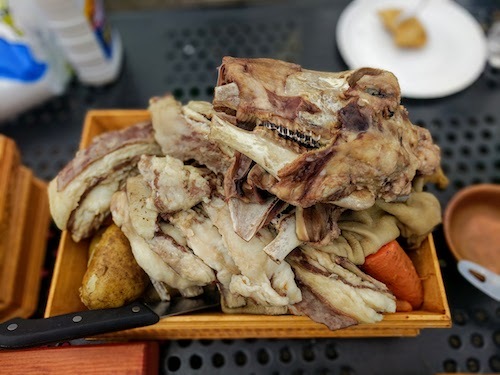 After some time and when the group started growing, quite a few plates of buuz, or Mongolian dumplings typically filled with mutton began to get places around on tables. These seemed to be the favorite of everyone, and admittedly I went back for a second. As advertised on the Facebook event page, there was a $20 per person charge for the event. 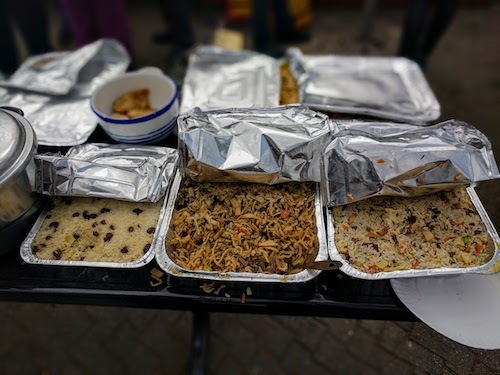 This basically afforded each person the ability to eat as much as desired, and by the look of some empty plates of buuz, this was the case. It was a small price to pay for the crazy amount of work that had been put into the preparation of all these foods. After enjoying the event for 90 minutes or so, quite a few others started trickling in, apparently worse victims of the MTA. 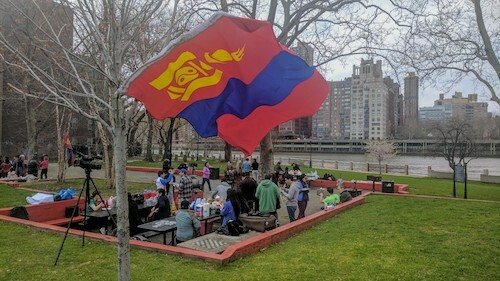 Some famous NYC Mongolians were in attendance, broadcasting the event live on Facebook. We were just happy to have made it for the day and for the chance to meet these very friendly people.